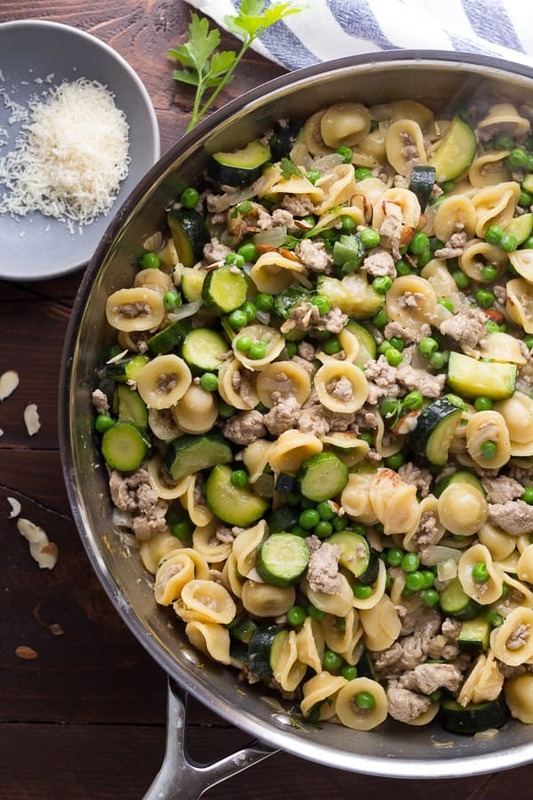 An easy one pan turkey pasta recipe that is packed full of healthy vegetables. Zucchini and peas are cooked up with the pasta with a touch of lemon zest, parmesan cheese and sliced almonds. A delicious week-night dinner! Well, I’m back from staycation land. It was fun while it lasted. There were Watermelon Margranitas and S’mores Sundae Cookie Cups. We all stayed up a little later and slept in a little later, too (even Kai!). But now it’s back to reality. The 5pm rush. The what-on-earth-is-for-dinner-dilemma. And we can’t leave those dishes until tomorrow anymore. So I have the perfect almost-no-dishes easy 5pm solution for us all! And it’s called one-pan pasta. I haven’t made a one-pan pasta recipe since waaay back in April…whoa. I don’t know what happened there! So I’m back…with a vengeance. Today’s one pan pasta recipe is inspired by the zucchini growing in my garden. And the peas too, even though they’re not ready for picking quite yet. 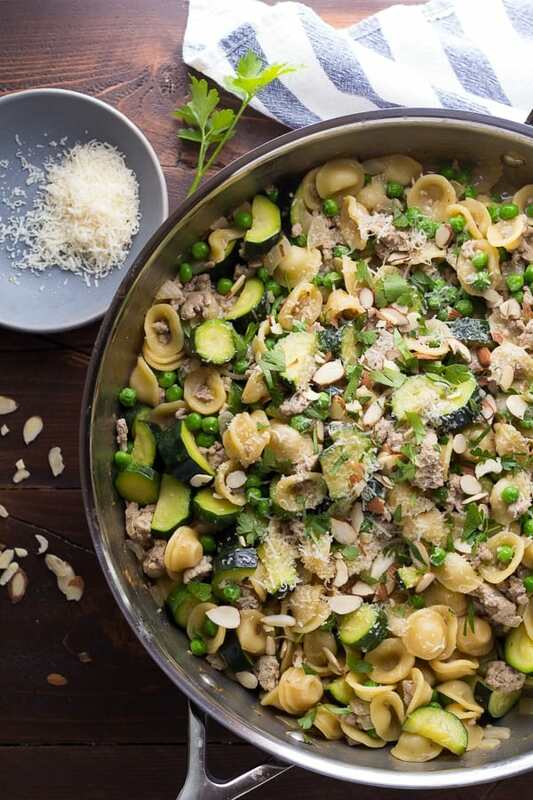 This turkey pasta recipe is full of fresh flavors: zucchini, peas, a hint of lemon, and sliced almonds. Some ground turkey to make it a complete meal. And I used orecchiette, which are basically mini cowboy hats, am I right? 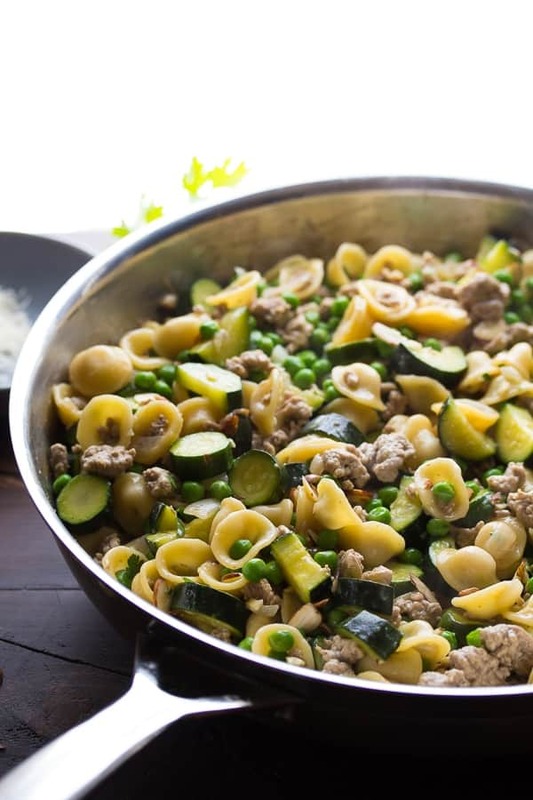 Orecchiette is just perfect for this one pan pasta meal, since they are small and compact, they cook up well in the small volume of liquid that is used. If you are new to one-pan pasta, here’s the deal: the pasta cooks up with the veggies and meat, and the starch from the pasta thickens the reduced sauce. As the pasta cooks, it absorbs SO much flavor from all of the other ingredients. So so SO much flavor. And this kind of meal is right up my alley: easy, healthy, simple, delicious and (almost) no dishes! Wooo! An easy pasta dish that cooks up in one pan. 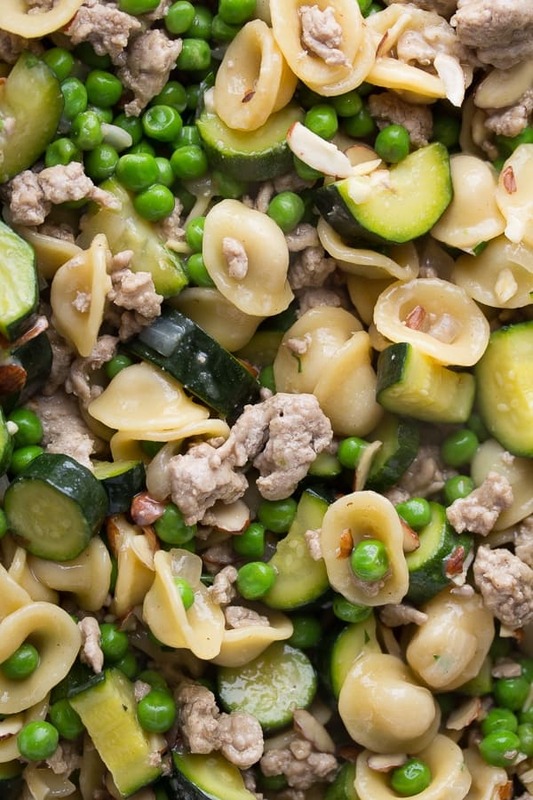 Ground turkey, zucchini and peas are cooked up with the pasta with a touch of lemon zest, parmesan cheese and sliced almonds. A delicious week-night dinner! In a large skillet, cook the turkey until no pink remains. Set aside on a paper towel lined plate. Add onion and cook for 5 or so minutes until translucent. Add the garlic and stir for one minute. Add the white wine and scrape up all of the brown bits from the bottom of the pan. Cook until reduced by half, around 2 minutes. Add the chicken stock, orecchiette and salt, and add back the turkey. Simmer for 10 minutes, stirring frequently, then add the zucchini and cook for another 10 minutes (stirring frequently), or until pasta is cooked through and sauce has thickened. Stir in the lemon zest and frozen peas. Cook for 3 minutes. Serve with almonds and parmesan cheese. Super easy and delicious. I added some lemon juice and red pepper for a little extra spice. Great recipe! Little disappointed in the turnout. 4 1/2 cups of chicken broth seemed crazy. Came out like a bland soup. Well that definitely doesn’t sound right, it should not be soupy. I’m sorry it didn’t work out for you, Sherrie. Would you mind telling me which pasta shapes you used, and if you used a pan or a pot? Thank you! I think ground beef would be great! Hope you enjoy it, Susan! LOL Jon Jon Early…or Jon Earky? Ha ha you have me laughing 🙂 Glad you liked the recipe and found it easy! Thanks for reporting back! I’m not seeing when to add the turkey? You put it back in at the end?????? Hi Janine, sorry if I’m too late replying here! So sorry, the turkey is supposed to be added with the pasta/stock/salt. I will edit the recipe. Thank-you for pointing that out. Did you really need 4 1/2 cups of chicken stock? That seems like a lot? Hi Jenilee, I hope I’m not too late! I thought the same thing, I started with 3 cups when I developed the recipe, but I had to add another 1 1/2. Since it cooks uncovered, the liquid does evaporate and the pasta starches thicken it as it cooks. Hope you like it! I just made it and it did use all 4.5 cups of broth. Leah | So, How's It Taste? Yum! This has all my favorites in it with the peas and zucchini! Bonus for it being a one pan recipe and it looks healthy! 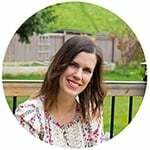 I know I told you I love the look of your site, and now I love your little graphics with the one pot meals, etc. Great touch! 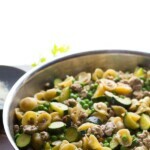 And I love everything about this dish — orrecchiette is one of my favorite pastas! This looks right up my alley — pinned! Oh thanks, Marcie! They were a last-minute addition and I’m so glad, because they’re my favorite part! What?! Thank-you SO much, Jessica, and I have to say I’m always admiring your photos, too! I have such a hard time photographing on a white background. Haha, I don’t ever make pasta any other way now! I love this new twist on it! Yeah, I really don’t see myself going back to dirtying another pot just to boil the pasta…not when it gets so much flavor from the sauce! Thanks, Ashley! Thanks so much, Beverley! It would definitely be perfect for a weeknight…so easy and almost no clean-up! Hi Denise! I just have to comment on my adoration for this quick and tasty recipe. I love meals that are insanely satisfying with minimal work (less hassle more happy). I have more zucchini than one can shake a stick at currently and we are constantly seeking new applications. Love this. OK, so you’ve sold the one-pot pasta idea to me in this post. And I love the flavours you chose to combine here, especially with the lemon and almonds … mmm! And love even more that you used those cute ‘cowboy hats’! What an awesome one pan dish! Looks so deliocus and inviting! What a great one pan meal! I really love the addition of almonds to this- that crunch really adds a lot! I feel like I add nuts to everything, but I just love the crunchy texture they give things…glad you approve. Thanks, Shelby! Oh what a fantastic one pan meal, Denise! I love orecchiette yet I always forget to cook with it! Sounds delicious with the ground turkey and zucchini! Thanks so much, Gayle! I think it’s my new favorite pasta!